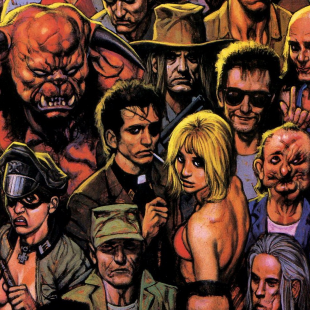 AMC is adapting the comic series Preacher with Breaking Bad's Sam Catlin as showrunner. To say that AMC found success with its TV adaptation of The Walking Dead is the sort of thing that one might refer to as an "understatement." The series has broken numerous ratings records and easily cemented itself as one of the most popular shows on cable television. Perhaps hoping to replicate that accomplishment, the network has revealed that it will once again be looking to comics for source material, this time with a show based on Garth Ennis and Steve Dillon's Preacher series. Preacher, which follows the disillusioned Rev. Jesse Custer on a literal quest to find a derelict God, will be tended to by the talents of Seth Rogen and Evan Goldberg as well as Breaking Bad-producer Sam Catlin. Rogen and Goldberg, who recently worked together on the film This Is the End, will write the script while Catlin will serve as executive producer and showrunner. The show will also be overseen by Original Films' Neil Moritz, Ori Marmur, Vivian Cannon, Ken Levin and Jason Netter, all of whom will also work in executive producer roles. Given AMC's track record for high quality shows (The Walking Dead, Breaking Bad, Mad Men), there shouldn't be too much concern over whether or the network can handle Preacher. That said, if there are fans with any doubts, it should be noted that the rights to the series didn't just fall into AMC's hands. The network apparently had to fight off some considerable competition to win the rights, a fact that will hopefully translate into it taking care with its adaptation.